American automobile models produced between 1960s and 1970s are called muscle cars. These vehicles are called “super cars” during that period. The term “muscle cars” was initiated by the horsepower race. Credits were given to John Z. DeLorean who was the president of Pontiac division. He violated General Motor’s policy by putting large engine to small cars. This gave birth to 1964 Pontiac Tempest GTO which started the muscle cars explosion. The popularity of DeLorean’s project inspired General Motors and its competitors to produce their muscle car brands. 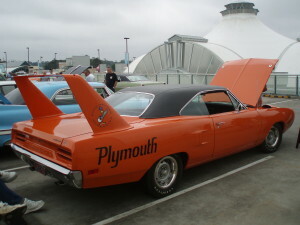 The 1960s muscle car brands include Barracuda, Road Runner, Camaro, Superbird, Cyclone, Firebird, Super Sport, Toronado, and Mustang. V8 muscle engine was developed by General Motors. It was the first one to use a high compression overhead valve. It assembled eight cylinders in two sections in one crankshaft. The use of single crankshaft gave the muscle cars faster speed and acceleration. Chrysler developed this engine in the 1950s. Hemi came from the hemispherical shape of the combustion chambers. The design of the chambers allows the engine overhead valves to be positioned at an angle. The position of the valve gives an optimum flow of the fuel into the engine. This is the first model that started the American muscle car craze. It runs from 0-60 mph at 6.6 seconds. It has V8 engine with 389-cid. This car weighs a staggering 3,470 lbs. The total number of units sold was 32,450. This model is the first one to use 401-cid V8 engine and has convertible’s beefed-up frame. Performance is 0-60 mph at 7.8 seconds and weighs 3,200 lbs. The total number of units sold was 69,367. This is considered as one of the most stunning muscle cars of all times. Certain features include 400-cid V8 engine, four-barrel carburetor, optional hood-mounted tach and power front disc brakes. It runs from 0-60 mph at 6.6 seconds and weighs 3,425 lbs. The total number of units sold was 81,722. This is one of the most unique models of Mustang. This car was built to satisfy the rules of NASCAR. It has V8 429-cid and runs from 0-60 mph at 6.8 seconds. Features include husky tires, suspension tweaks, and wide front track. It weighs 3,870 lbs. The total number of units sold was 858. This model has one of the most desirable looks in the muscle car era. The unique feature of this car is its cowl-induction hood. It has a 302-cid V8 engine. It runs from 0-60 mph at 7.4 seconds and weighs 3,765 lbs. The total number of units sold was 20,302. This is one of the most extravagant muscle cars ever produced. It has a 440-cid V8 engine with a single four-barrel carburetor. Certain features of this model include big rear wing and wind tunnel shaped snout. It runs from 0-60 mph at 6.7 seconds and weighs 3,841 lbs. The total number of units sold was 1,920. The features of this car include sporty interior with four-speed manual transmission and 426-cid V8 engine. It runs from 0-60 mph at 5.6 seconds and weighs 3,900 lbs. The total number of units sold was 666. The features of this car include 454-cid V8 engine, F41 suspension, power front disc brakes, five-spoke wheels, blackout grille, and cowl-induction hood. It runs from 0-60 mph at 6.0 seconds and weighs 4,000 lbs. The total number of units sold was 9,502. For more information on American Muscle Cars [http://www.american-musclecars.net/] and Types of Muscle Cars [http://www.american-musclecars.net/types.html] Please visit our website.